Blue carnations have a short history, but, like many other flowers, can carry a special meaning. Since Victorian times, people have used flowers to convey love, friendship, devotion and a multitude of other emotions. The type of flower, the color and even the way the flowers are arranged can carry a world of meaning. Carnations, especially, have a long history of symbolism. Whether used at a wedding or “just because,” carnations are second only to roses as signs of heartfelt sentiment. The idea of flower meanings is present in many cultures. The Western tradition probably started in Constantinople in the 1600s. "Flowers, the Angels' Alphabet" by Susan Loy states that Seigneur Aubry de la Mottraye and Lady Mary Wortley Montagu, who both spent time in Turkey, are credited with bringing the concept to Europe in the early 18th century. Several "Language of the Flowers" books were published in the early 19th century, but according to Beverly Seaton's "The Language of Flowers: A History," the first was probably B. Delachenaye's "Abecedaire de flore du langage des fleurs," published in 1810. The carnation dates back more than 2,000 years. 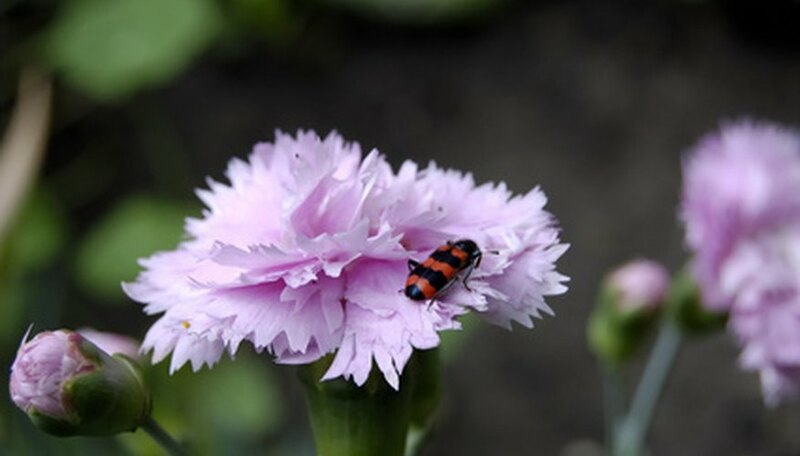 The carnation’s Latin name is Dianthus caryophyllus, when means “flower of love” or “flower of the gods.” According to Christian mythology, pink carnations sprang up where the Virgin Mary’s tears fell at the foot of the cross as Jesus was crucified. Because of that, pink carnations are especially associated with a mother’s undying love. Blue carnations don’t share the long history of meaning with other carnations because they don’t occur naturally. The first appeared in the 1970s, when people dipped white carnations in food coloring. In 1997, 12 Australian scientists genetically engineered the first blue carnation. It was actually violet-blue, and was commercialized under the name "Moondust." Though the blue carnation itself may not have a long and rich history of meaning, every other carnation color does. Go to almost any florist's Web site and you'll find carnations in general express devoted love, fascination and distinction. Blue’s closest natural relative, purple, implies capriciousness or the tendency to be moody. Any solid carnation implies “yes” when used to answer a question. Blue has long been used symbolically in art and writing, and blue flowers of any kind are often used to symbolize peace, tranquility, truth and spirituality. Blue’s association with truth makes blue carnations popular at weddings, where they serve as a reminder of the devotion and true love the bride and groom have for each other.